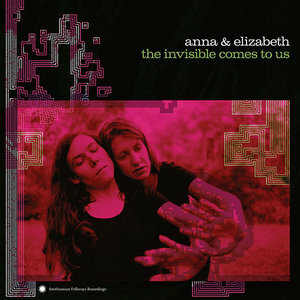 On the enchantingly experimental new album The Invisible Comes to Us, Anna & Elizabeth balance folklorist obsession with avant-garde sonic exploration, resulting in a deeply immersive and enriching opportunity for the ears. Fans of both experimental music and folk sounds often experience a dearth of options. That cross-section can be scant; it's a certain sliver of the Venn diagram. Sometimes it's challenging to find simultaneously intelligent and approachable music in that space between polarizing weirdness and mundane twang. The boundary-pushing act Anna & Elizabeth does not always hit that sweet spot, as the new album The Invisible Comes to Us forces the listener into a near-uncomfortable sonic strangeness at times. Still, the duo's penchant for risk and discovery -- even when it lands the pair in noise purgatory -- ultimately is refreshing. Consider the twosome's experimentation a rejection of the hopelessly generic cycle of common roots music tropes -- the outlaw woman, the guy-girl folk harmonizers, the way-late Mumford & Sons copycats. Anna & Elizabeth go their own way, with academic researchers' respect for folk music history and enough independence to not get trapped in amber like the artifacts they seek to emulate. Let's go back: Anna & Elizabeth is the pairing of Anna Roberts-Gevalt and Elizabeth LaPrelle, who hail respectively from Vermont and Virginia. The act's 2015 self-titled album, on Free Dirt Records, was focused down to an essence, with a folk purity that honored the past without challenging tradition. The record was excellent, but The Invisible Comes to Us earns higher marks for keeping the listener guessing throughout. There's little predictable or "safe" on these 11 terrific tracks. Roberts-Gevalt and LaPrelle share an insatiable hunger to find little wonders of folk music past. They've scoured various collections of old-time recordings and historical documents to mine for objects of inspiration. The songs of The Invisible Comes to Us were adapted from treasures they came across at archives like the Blue Ridge Institute at Virginia's Ferrum College and the Helen Hartness Flanders Collection at Vermont's Middlebury College. "These are songs we first heard in small archives in our home states, Virginia and Vermont -- recordings made in living rooms and kitchens -- songs the singers learned in their childhoods," they write in the album's packaging. "The characters and the landscapes they occupied grew rich in our minds. This record grew out of the desire to show you the world we saw in these songs -- which led us on our own winding path collecting sounds and sound makers that would help us in our quest." Few young folk artists today show such reverence and such overwhelming love for the primary sources. And when Anna & Elizabeth apply effects -- the hissing, buzzing and droning -- that push the songs out of a comfort zone, they still show incredible respect for the original songs. Noise does not signal distance. If anything, the sonic hums and moans convey an appreciation -- they draw increased attention to these long-living words. All is not pushing the sonic envelope on The Invisible Comes to Us. "John of Hazelgreen" contains a captivating old-time folk core, as Roberts-Gevalt and LaPrelle fuse their voices in a simple melodic accord that's devoid of the noise that permeates much of the other tunes on the album. But most of the time, Anna & Elizabeth do challenge themselves to seek the outer limits of Americana, of folk, or whatever you call this music. Roberts-Gevalt, LaPrelle and their many collaborators (10 other musicians receive credits on The Invisible Comes to Us) play with the Mellotron, Moog bass, pump organ, euphonium and much more. Perhaps the most striking feature here comes via the vocoder, which is used to distort voices to haunting effects on the relatively spartan "Virginia Rambler" and on the much-spookier, even nightmarish "By the Shore". Kudos to Smithsonian Folkways Recordings for signing this act. The label -- linked to the federal Smithsonian Institution -- mostly repackages older songs from American and world music traditionalists. It's encouraging -- that the outfit has embraced a pair that is embracing the past while darting fully forward into an uncertain sonic future. The Invisible Comes to Us makes that ever so clear.